Last month I wrote a story of how Francis Suarez had received $962,983.00 in donations to his campaign to become Strong Mayor, and if you added up the donations, you would have discovered that 42 individuals/companies out of the 145 total donors to that point had donated a total of $485,000.00, of 51% of that $962,983.00. One of those deep pocket donors, Drive Development, on June 15th, donated $30,000. If you look below at the new list of donors for the month of August you will see that Drive Development donated another $25,000, (Number 3,) and then if you look further down to you will see that Drive Construction donated $20,000 for a total of $75,000. (Number 20) Both companies are "managed" by Douglas Cox. 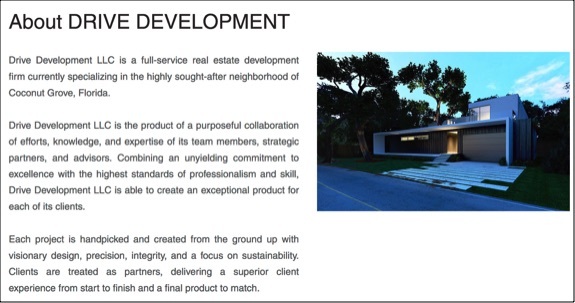 Drive Development's claim to fame is that the are one of the companies that have been building those boxy, white, modernistic houses in Coconut Grove that so many of the older Grove residents have been complaining about. If you look down again to Number 19, you'll see that a company named All Kinds Of Signs, donated $20,000. This company is owned my Nicole and Susan Pearl, who also happen to be attorneys, and Nicole Pearl is the Registered Agent for Drive Construction. 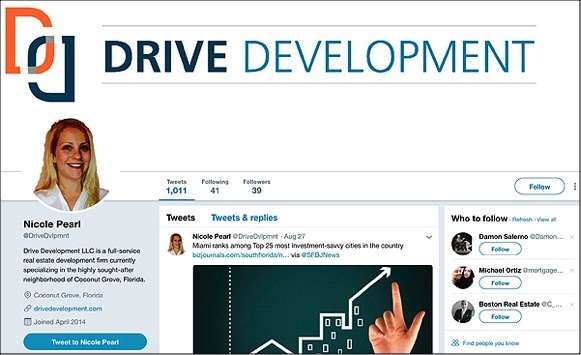 A search of Twitter also turned up a Twitter Page for Drive Development featuring Nicole Pearl. 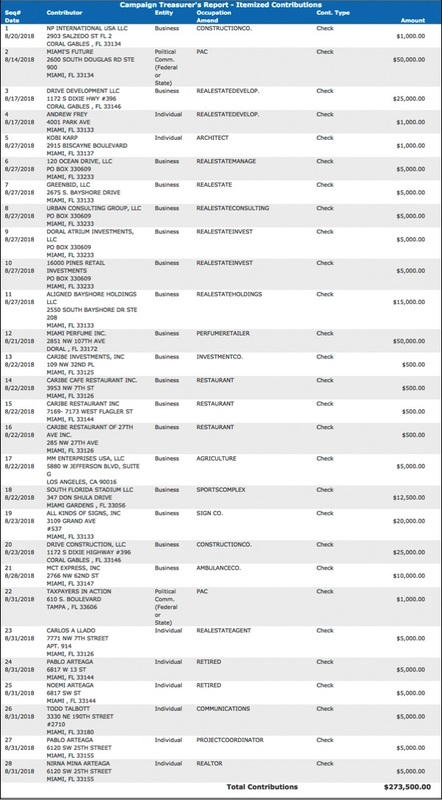 If you'll scroll down and look at Number 17, you will see that a company named MM Enterprises USA, LLc, donated $5,000.00 to Suarez's campaign. MM Enterprises USA, LLc, which is also known as MedMen Enterprise Inc, after the US company did a reverse takeover of a Canadian company is considered to be the lagest cannabis consumer company in the northern hemisphere, and just started trading as a public company in Canada. It is expected to become a publicly traded company in the US. Back on August 1st, I wrote a story about how Joe Carollo had engaged in a quick bit of fundraising for his ECO, and how 2 individuals linked to 4 companies had contributed the bulk of the money he raised. One of those individuals was a woman named Jayne Halli, and at the time I mistakenly assumed that she was the owner of the 2 companies that gave carollo $10,000. I was wrong. It turns out that she is the attorney for the Terra Group owned by Pedro and David Martin, and it turns out that the Martins have dozens of corporate names registered and usable as fronts for bundling donations to political candidates. In the Martins' case tt turns out that of the donations that I posted in my August story, 4 donations came from companies controlled by the Martins totaling $8,000. This month, they upped the donations considerably. Numbers 7,8,9 and 10, are companies controlled by the Martins, and this time the total was $20,000. To date, the biggest donor to Suarez's campaign to become Strong Mayor has been his PAC, Miami's Future, Inc., which has donated $150,000. Here is the detailed list of the individuals and companies who donated $273,500 to help him make Miami safe from influence peddlers and special interest lobbyists in August. This connection would support a claim that the $20,000 that she and her sister gave was part of a bundled donation from Drive Development totaling $90,000. 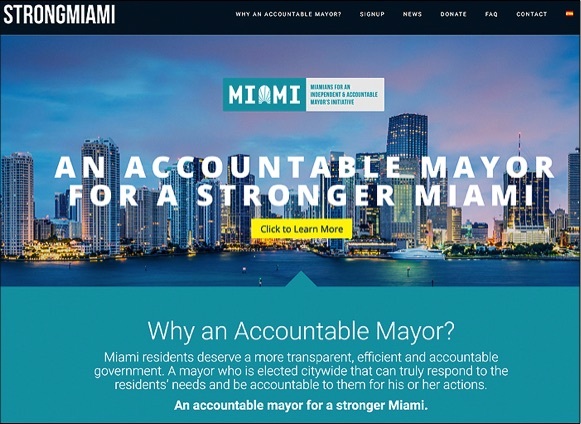 That makes them the current holder of the title of most money given to Francis Suarez's Strong Mayor of Miami campaign, and raises a question of what kind of return would a housing developers expect for $90,000? 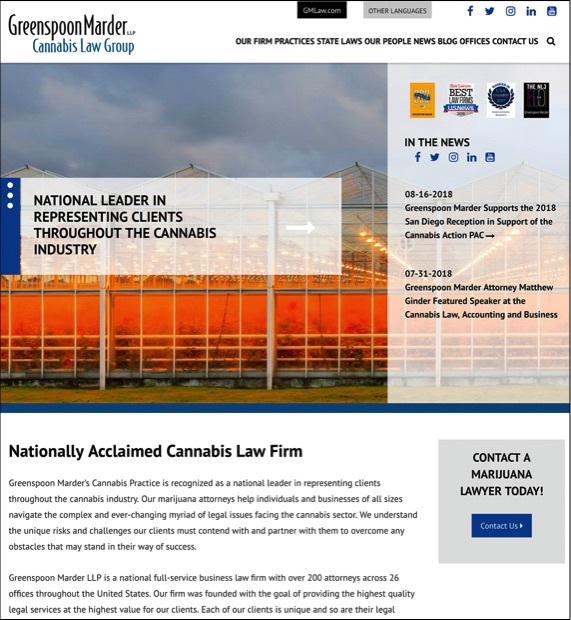 On September 4th I wrote a story pointing out that Greenspoon Marder, the law firm that Suarez had recently joined "As Counsel," was promoting itself as one of the premier law firms in the country representing the "cannabis industry." Francis Suarez's Strong Mayor committee has sent out their first mailer. If this is an example of what passes for smart, targeted messaging in the mind of Francis Suarez and his campaign chairman Jesse Manzano, then the real moron is Suarez, and all the stories of Manzano being a lightweight who keeps taking money from gullible politicians under false pretenses is true. 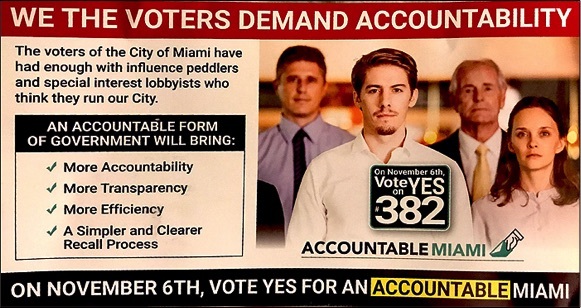 The first glaring issue is the continued use of generic stock photos to represent the citizens of Miami. In fact, this is the 2nd time that they've done this. 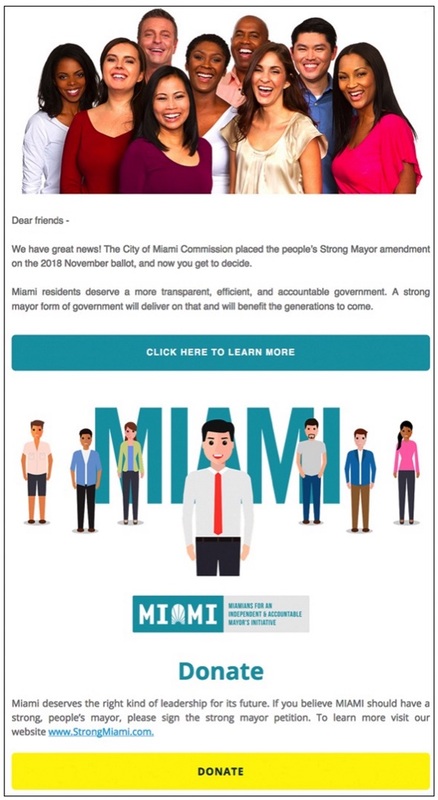 Last month I posted a copy of an email message that the campaign had sent out after the referendum language was put on the ballot, and as you can see, in that stock photo they at least tried to use a couple Black people and an Asian. This time, they just decided to go straight for the generic white folk demographic, which then raises a question of whether this mailer was sent to black folks in Overtown and Liberty City? who think they run our city." Talk about a classic example of the pot calling the kettle black! This claptrap about being tired of influence peddlers and special interest lobbyists comes from the same Francis Suarez who went to the National Conference of Mayors in Boston earlier this year, and tagging along with him to lurk behind the potted plants in the lobby of the hotel was none other than lobbyist Steve Marin, who for years was notorious for treating both Suarez and Marc Sarnoff as his personal sock puppets. Carlos Gimenez Jr. hates it every time that I use portions of the email he sent an anonymous blogger about his experience dealing with the Miami City Commission over the Red Light Cameras back in 2010, but the fact is that this letter remains one of the best examples of how political influence was, and continues to be used by people like Marin inside City Hall today, and what a hold a guys like Marin still has on Suarez. Last year, Suarez's campaign and PAC paid Marin $206,575.00 for political consulting and campaign work. But Marin is far from being the only influence peddler and/or special interest lobbyist who is close to Francis Suarez. All you have to do it look at the campaign reports for both his campaign account and his PAC and see who gave him over $2.6 million for his campaign for Mayor against 3 candidates who collectively raised $1,203.00, and spent $274.00. 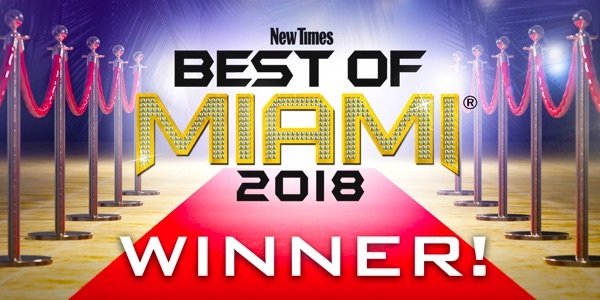 Better yet, scroll down to my next story where I continue with my latest reporting on the hundreds of thousands of dollars he collected last month for this campaign to become the Strong Mayor of Miami. 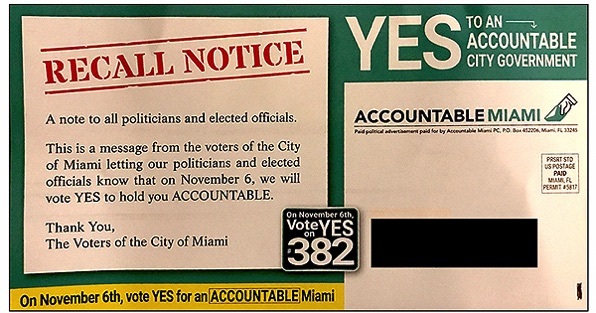 Francis Suarez is just another hack politician on the take, and the idea that this mailer purports to be from "the voters of the City of Miami," warning the politicians that they are going to start holding them accountable is nothing other than a demonstration of how little respect he has for the voters of Miami. There are still 2 more months for civic minded folks with tens of thousands of dollars burning a hole in their pockets to donate to the campaign of a guy who claims to be against people who donate tens of thousands to influence politicians like him. In the world of celebrity culture, birds of a feather tend to flock together. 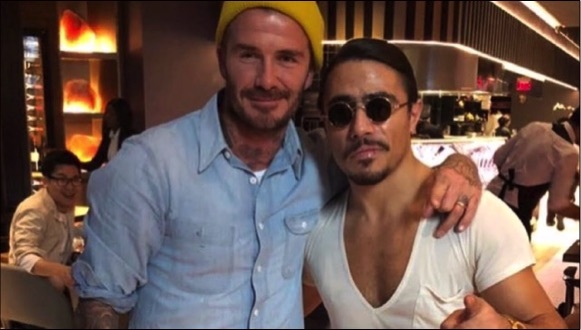 Maybe, if the voters of Miami are gullible enough to vote for the Billion Dollar stadium deal, Salt Bae can open a restaurant at the stadium as part of the deal, and name a dish after David Beckham, and another one after Jorge Mas. In a decision that could have significant repercussions, an overwhelming majority of the members of FOP Local 20, voted down a contract proposal that was negotiated by Miami's thug duo, Captain Javier Ortiz, and his BFF Sergeant Edward Lugo who have had the union in a choke hold for the last 4 years. 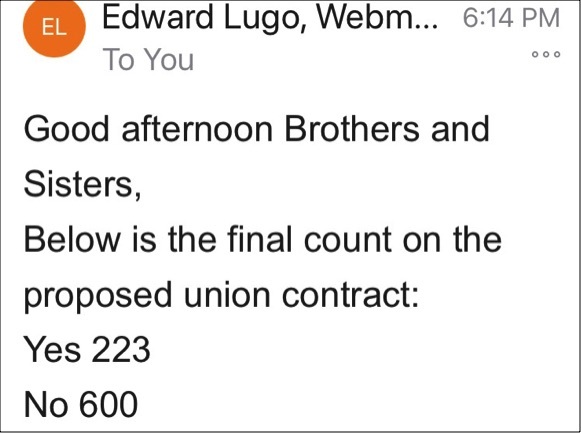 It looks like the members have tired of all of this, and with an election for new union leadership coming up in December, this might be the first sign that these two guys and all the dirty deals that they've been accused of over the years might be coming to an end.